Specification: • Overall Dimension: 8.2 x 5.5 x 3 inches • Item Weight: 9.6 ounces • Power Source: Corded-electric The Dual Thermostat and Humidistat is designed for use with Power Attic Ventilators. The dual controls allow for a user to limit the operation of the fan based on user selected temperature and humidity levels. 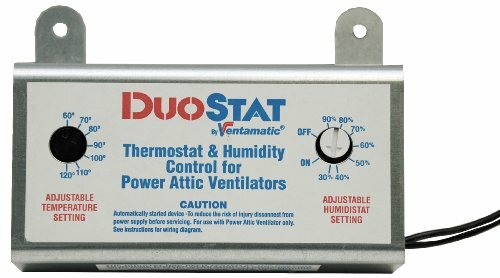 This item is often called a Duostat and is an essential tool for homeowners to regulate the temperature and humidity levels while preventing their power attic ventilator from running in continuous operation mode. The Duostat allows for worry free operation during both winter and summer months by allowing the homeowner to not manually turn on and off their attic fan when needed. This Ventamatic Dual Temp/Humidity Control helps power attic ventilators equalize inside and outside attic temperatures to remove excess heat from your attic in summer and humidity in winter. Accessory Type Ventilation accessory. Year-round control removes excess humidity and protects roofing components Controls up to three units, not to exceed 10 amps. THERMOSTAT/HUMIDISTAT CONTROL: The Dual Thermostat and Humidistat is designed for use with Power Attic Ventilators. The dual controls allow for a user to limit the operation of the fan based on user selected temperature and humidity levels. ENERGY EFFICIENT POWER ATTIC VENTILATOR: It provides energy-efficient operation of power attic ventilators and the temperature ranges from 50°F to 120°F. DUAL HUMIDITY CONTROL: Adjustable Thermostat and Humidistat Control has 10 Amps, 120 Volts AC. Thermostat setting adjusts from 60 - 120 degrees F (normal settings are 85 - 110 degrees F). Humidistat setting adjusts from 30 - 90% (normal settings are 60 - 70% depending on local humidity levels). If either setting is too low, fan will run continuously. If setting is too high, ventilation will be inadequate. It has limited lifetime warranty. If you have any questions about this product by Ventamatic, contact us by completing and submitting the form below. If you are looking for a specif part number, please include it with your message.